The DAAO project team has completed all deliverables of LIEF grant LE140100120: DAAO, enabling next generation e-Research in Australia’s visual and design cultures. My final task is to write the ARC final report, and golly it’s great to look back over everything we’ve achieved during this project. For a quick view of what the team worked on, here’s our deliverables table. Skip down for a more detailed excerpt from the final report. Significance, results and outcomes of the Project. Developments focussed on enabling DAAO’s research and contributor community in three key areas: a) research collaboration, b) access to data for repurposing (i.e. for visualisation) in other platforms, and c) efficiency and relevance of data input and sharing. DAAO now provides functionality for researchers to collaborate on projects across all data entities, not just biography. A new record grouping and moderation workflow provides a significantly faster and more meaningful path for Moderators to verify DAAO content that fits their domain expertise. This is crucial to DAAO’s ability to maintain current and verifiable content. The updated notification system now provides members and site maintainers with a more transparent experience; this is key to enabling members to create research networks through the DAAO. The expansion of DAAO’s OAI Provider, from which the NLA Trove service and HuNI harvest data, allows for greater repurposing for DAAO data in other platforms. The existing EAC-CPF feed of Person and Group type entities has been enriched to include more entity data and relationships between records. A new RIF-CS feed of Event and Recognition type entities syndicates an additional >25,000 DAAO records, expanding DAAO’s feed by more than 150%. Automated linking of entity data has vastly increased site efficiency and comprehensiveness by reducing the need for manual data entry. Updates to DAAO’s conceptual data model reference international standard FRBRoo. Schema updates have ensured that DAAO can collect content relevant to our research community needs. All developments were implemented as a step along the path to a larger vision of data accessibility. For example, a major refinement of the DAAO native XML export will make further OAI Provider expansion possible, while updates to DAAO’s record grouping functionality pave the way for future development of a layperson export functionality, which could allow individual researchers to grab targeted batches of data as JSON via an expanded version of DAAO’s API. Did the Project lead to exciting new research directions, innovations and/or lay foundations for new research and/or partnerships? YES. CIs Harley and Ledbury led two data re-use visualisation proofs-of-concept designed to inform and test DAAO’s schema and export developments against researcher requirements for data repurposing: 1) a visualisation of DAAO/Scanlines networked data; 2) an exhibition rendering PoC based on exhibition and works data previously contributed to DAAO by the University of Sydney. As a further example of how DAAO data is being used in other platforms, The Australian Directory of Electronic Literature and Text-based Art (ADELTA), ARC funded infrastructure based at the University of Western Sydney, built an API within the DAAO server environment to use DAAO as a naming service. This further embeds DAAO into other publicly funded research infrastructure. Contemporary Art & Feminism (CAF) at Sydney College of the Arts has incorporated DAAO into its national outreach program. CAF has funded a string of sessions across the country to train new researchers on the DAAO. Sessions were hosted by cultural institutions including the Art Gallery of NSW, Bathurst Regional Gallery, Dubbo Western Plains Centre and Wollongong Art Gallery. DAAO used data on the National Women’s Art Exhibition to test its ability to respond to CAF research questions through data visualisation. This visualisation was then implemented as a generic tool that can be applied to any other DAAO Event record. The Remix Public Archive (seed funding from Arts QLD) is using DAAO as a repository for its data on Australian artist-run culture 1980-2000 and hosted an initial Moderator workshop for its members. CI Sierra secured funding from ACUADS to increase our outreach in Western Australia. This enabled us to run a data exchange with Artsource, the peak membership body for visual artists in Western Australia. The partnership resulted in the creation of 416 NEW records and update of 9 stub records. Are there identifiable national benefits, including economic, social, cultural and/or environmental contribution, resulting from this Project? YES. DAAO is a robust and free online research tool open to use by all. As an open access resource, DAAO has a commitment to maximal sharing of its data. DAAO is the second largest contributor of Person records to Trove. DAAO is second only to Libraries Australia, which draws on the Australian National Bibliographic Database, bringing together records from libraries throughout Australia (figures provided March 2015). As stated above, this project increased the volume of DAAO records available for harvest by other data services by over 150%. Content projects such as CI Speck’s AEAF data project have made archives that were not previously indexed online accessible via the DAAO. Research collaboration between Partner Organisations. CIs were involved in all key areas of project management and in defining the project outcomes, particularly in relation to schema and export refinements and upgrades to the researcher collaboration functionality. As outlined above, Lead CI Harley and CI Ledbury led two proof of concept data visualisations designed to inform schema refinements and export functionalities aimed at enabling researchers to deploy and repurpose DAAO data in other platforms. As lead of HuNI, one of DAAO’s key data sharing stakeholders, CI Verhoeven helped to define the expansion to DAAO’s export functionality (DAAO Native XML and OAI Provider) to ensure the project met its objective to enable the repurposing of DAAO data in other platforms and specifically through HuNI’s collections interface. CIs Mendelssohn, Inglis and Speck joined other members of the DAAO Editorial board to inform specifications and test developments for the researcher collaboration module and other UI updates necessary for DAAO’s moderation workflow. CIs Harley, Ledbury, Bennett, Sierra and Mendelssohn offered strategic guidance to the project team as members of the DAAO Management Committee. Harley also sits on the DAAO Technical Committee. CIs Anderson, Sierra, Speck and McNeil initiated content sharing projects with collecting institutions nationally (content from: National Library of Australia, Art Gallery of WA, Art Gallery of SA, Queen Victoria Museum and Art Gallery Tas., Australian Experimental Art Foundation, Mildura Arts Centre, Art Gallery of Ballarat, Geelong Gallery, BUDA House, Castlemaine Art Gallery &Historical Museum and Benalla Art Gallery). 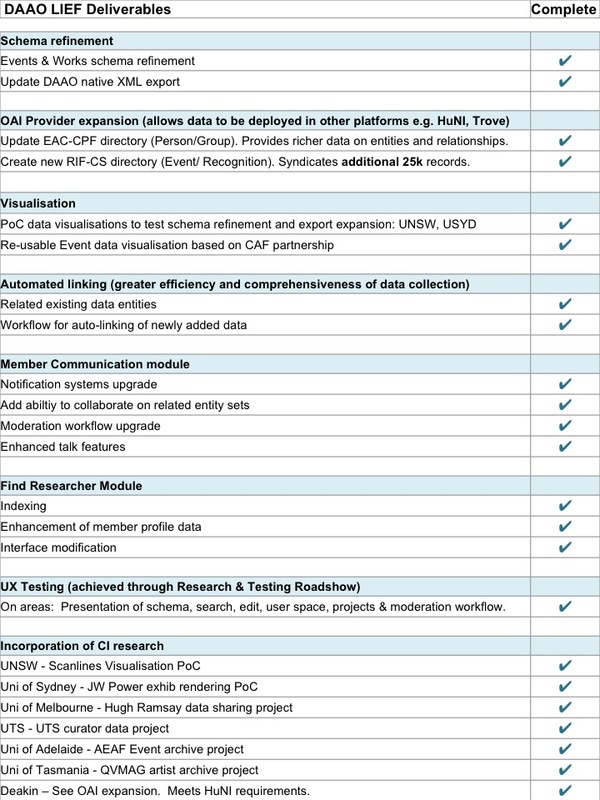 These data sharing projects enabled the project team to test schema and UI upgrades with real data specific to a range of research domains throughout the development timeline. Here is a graphic showing how our Partner Organisations helped us meet our project outcomes and connect with other cultural organisations.